April | 2011 | E-verything! Serendipity webinar overview, PLN – getting started? Apologies everyone – I did it again this week ie was late starting the recording. I think I may have to resort back to my strategy from before the days of the Elluminate recording reminder and have a post-it on my screen. 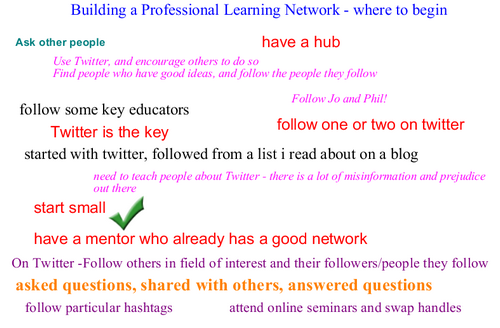 D – “Building a Professional Learning Network – where to begin” topped the poll. We started with a whiteboard brainstorm with everyone sharing their ideas about how they had begun themselves or where they might suggest others start. The discussion was further developed in text and audio with people expanding on the points made on the whiteboard. The focus of the discussion was mainly around Twitter but with reference to other PLN starting points such as online seminars and face-to-face conferences. There was also reference to the use of hubs such as iGoogle from an individual perspective and the increasing number of website hubs being called “PLN”s that are often focussed on being a meeting point for a particular educator group. We then moved on to talk about a question raised by one of our group who is fairly new to Twitter, namely how to get people to follow you when you are new. This gave rise to a wide selection of suggestions on the whiteboard, in text and through audio. We briefly revisited the map to capture the whereabouts of those who had joined after we had moved on from that point. Finally we moved on to think briefly about our “Takeaways” from the session. This was a really interesting session – PLN is a topic that often surfaces in different guises and it never fails to generate lots of discussion, provide many new ideas, and deliver much learning! I was thinking yesterday about a recent event where I found myself standing up for 25 minutes in front of a potentially negative audience of colleagues. My brief was to give them a look at what is “out there” in terms of future online/e-learning possibilties that might be significant for them. The contemplation was triggered in part by elements of a long conversation between myself @mgraffin and @philhart when we met for lunch in Perth yesterday. As seems inevitable when “e” minded educators meet we touched upon the issue of encouraging our emphatically non “e”, non tech colleagues to at least explore the possiblities and dip a toe in the water. Later on when Phil and myself were cooking dinner we returned to the theme and diversified into some of the underlying personality traits, ideas and strategies that inform how we interact with students and colleagues. As a child and teenager I was paralysingly shy, would rarely speak in any group situation, and always hid at the back. However I also took part regularly in school drama productions! I found I could do this by adopting a different persona, in a way I was standing outside myself and becoming consciously an entertainer. The shyness is still there especially when I meet face-to-face with new people although I can now mask it fairly well. It fascinates me that I am far less shy in my online persona particularly on Twitter and in Elluminate. There are many possible reasons for this that I should talk about another time. The tendency to stand outside and watch myself has carried over into my role as an educator. I think that one of the reasons that I am not generally good at reflecting in writing after an event is because I am constantly operating a very short duration reflective cycle during a class or immediately afterwards. This is especially so with respect to “critical incidents” so by the time I get near a keyboard (trying to handwrite reflections kills them stone dead for me) and have time to write everything has already happened in my head so writing it seems unnecessary. Anyway enough of these digressions, Phil and myself were discussing how we work with students in different contexts. As an illustration of the way I adopt a different persona I talked about the recent two day professional development forum for lecturers in my organisation. In my experience across a number of organisations both here in Western Australia and formerly in the UK these sorts of events are generally disliked for various reasons including: information overload; the time taken; and the fact that not all of the sessions will be relevant or interesting to everyone. So to be asked to speak almost at the end of the two days about a topic that is certainly not “dear to the hearts” of many of my colleagues was a daunting prospect. I decided right from the start that whatever I did: had to be fast-paced but also conversational in style; had in some way to entertain as well as to engage; and also had to have some degree of interactivity. Being up on stage with a microphone and data projector is not the ideal situation for generating engagement or including interactivity but it can provide opportunities to entertain! Because several colleagues expressed an interest in the slides and links I had used within them I have uploaded them to Slideshare. I work in vocational education albeit as a literacy/numeracy educator. Because of the context the vocationl skills of my colleagues are very highly valued and constantly updated so in my session I tried to draw a parallel between this and the need to have comparable skills in the teaching strategies and e-tools that suit the needs of our 21st Century learners. I also raised the issue that while we try to make learning as flexible as possible for our students using numerous blends often customised for the individual our own professional development is still tending to follow the old model of all sit in a room together and listen to speakers talking about subjects often chosen by others not ourselves. Developing and accessing a PLN, attending webinars and blogging about educator related topics are easily recorded and tracked these days so there is no reason why these shouldn’t form part of our recognised professional development. The session generated some interest from colleagues as several have arranged to catch up with me next term and talk about some of the possibilites for some of the “e” strategies in their own teaching areas. When I consider how I work with my regular students I think it is critical to try and engage them but it is less important to entertain them. However when I am trying to bring colleagues on board with something new being entertaining becomes vital in order to generate a positive memory of the message. This session came about because I have noticed lot of relatively new Tweeters following me recently & also had to do a very quick “Twitter 101” of the basics for a colleague just starting to tweet. This started me thinking about what happens next, once people have started to tweet, know about @, DM and RT and have joined conversations. It seemed to be time to talk about Twitter again. Twitter is one of our recurring themes, we have had 3 former webinars on Twitter, two of them back in November of 2009 where we looked at managing your Twitter account for security in “Twitter – a clean nest” and Shelly Terrell gave us a session on using Tweetdeck. In 2010 we discussed whether there should be “rules” for using Twitter. 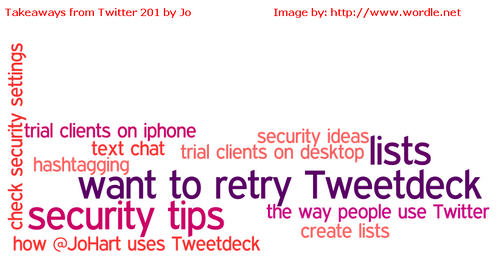 So in this session we looked at Twitter just little beyond the basics of tweeting. As usual we recorded the session (please let me know if you access it). There was a lot of discussion throughout – especially in text but also with audio. We started with a look at what people would like to take away from the session and moved on to where we were all coming from with Twitter. Most of us already had quite a lot of Twitter experience, but that some were very new to Twitter. We moved on to look at desktop clients, using Twitter from a phone. I App Shared my own Tweetdeck for illustrating and discussing some of the planned points and those raised throughout. This included putting out a #SerendipEd tagged tweet to my PLN for their top Twitter tips that were instantly displayed in the #SerendipEd column on Tweetdeck for everyone to see. The discussion moved on to lists, how we use them how others use them, the usefulness or otherwise of automatically generated lists. This moved us into a quick look at account security and management to reduce the risk of scams, hacking and phishing. The “takeways” is always a really interesting question as it is sometimes the unexpected as in this session where the security aspect was the best “takeaway” for several people . This session seemed to go extremely well despite my own doubts as always that it might be too “me centric”. I always enjoy discussing Twitter and its potential because I use it so much and have gained so much from it in terms of establishing, and learning from, my own PLN. Our next session is an Edublogs “Serendipity” session on Thursday April 28th at 23:00 GMT/UTC (Afternoon/Evening USA) or Friday April 29th at 7am West Aus, mid morning Eastern States Aus depending on your timezone (check yours here) – in the usual Elluminate room. This is one of our fortnightly unconference sessions where we invite you to bring along your “hot topics” and “burning issues” for our poll on the topic of the day. If you want to propose a topic in advance then visit the Serendipity Wallwisher and add your topic. 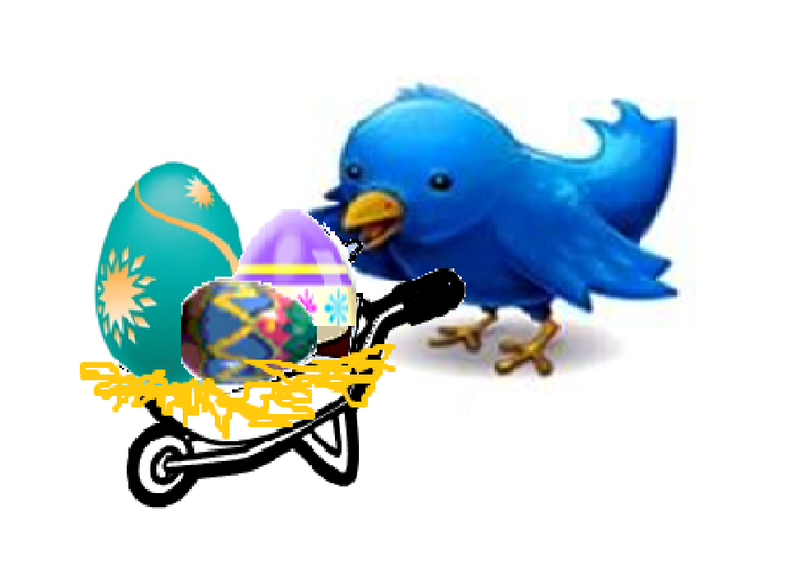 I hope you enjoy the Easter eggs – they look yummy. So kind of the Twitter birds to deliver them! A couple of weeks ago I was part of an incredibly exciting event here in Western Australia. The Federal Government, through the Department of Education, Employment and Workplace Relations (DEEWR), is in the throes of developing a new National Foundation Skills Strategy for Australia. Part of the public consultation process for this has been a series of focus groups around the country in major cities and some regional centres. These have been run on a “World Café” model with participants in small groups re-mixed several times. Because Western Australia has huge issues around geographical isolation the forward thinking Literacy people from the Department of Training and Workforce Development suggested a variation to the process that would enable regional participation. The suggestion was that an Elluminate virtual room would be a possible solution! I teach literacy/numeracy and I currently deliver entirely online using Elluminate as a major component of my blend. Because of this our State Literacy experts knew of my Elluminate experience and asked me both to advise on the best way to do this and to be the primary Elluminate moderator for the whole process. From the moment I was asked for my input I was completely ”hooked”. It was a challenge, and an opportunity to show what is possible with Elluminate. Incidentally throughout the whole planning process I didn’t meet “face to face” with anyone else involved in planning the event. About 90% of communication was through email with around three medium length phone calls and an Elluminate meeting. What I am giving here is the whole process from my perspective. It can’t be over-emphasised how much it was a team effort. It would not have been possible without: the vision and drive of the literacy experts from the Dept. of Training and Workforce Development; the superb moderators who managed the discussion rooms; and the continuing support throughout from the Sector Capability people at WestOne. This post is a “window” on the possiblities, outcomes and the event itself from my perspective as the Elluminate adviser and primary moderator. from my own experience, apparently heavier in terms of bandwidth, as greater dropout and other issues such as lag experienced when breakout rooms are in use, particularly when participants may have slow connections. The last of these is particularly relevant to our context in regional Western Australia. We regularly experience poor connection speed/low bandwidth despite our supposed broadband connections. Although Elluminate generally works very well in these conditions it behoves us to avoid the higher bandwidth options where possible. Having instantly dismissed breakout rooms because of our regional/connection issues the obvious and logical option seemed to be several separate Elluminate rooms. As I write this I can visualise people throwing up their hands in horror at the logistical issues and indeed my first thought was – how could that possibly be managed to ensure that people move to the correct rooms to remix and balance numbers at each change. four to five rooms designated as “Discussion Tables” each facilitiated by a moderator. The participants would then move and remix between the “Discussion Tables” as necessary. So planning progressed with the initial thought being to pre-arrange the groups and send each person the links they would need. Even as I was saying this my inner self was saying No! No! This will be a disaster! In my experience if you send people more than one Elluminate link in an email there is a high risk that 10-20% will click on the wrong one at some point. After further thought I came up with the solution that we adopted. This was to have whiteboards in the rooms at each group remix/changeover point. These would have participant names grouped with a live link for them to use to move to their next room. There was an additional advantage in this as it enabled us to rearrange groups at the last moment to compensate for any non-attendees. We would then ask participants to enter their next room and afterwards to exit the one they were leaving. The next challenge to the Elluminate environment was the final activities. In the “real” (face-to-face) meetings these activities are comprised of 8 questions posted around the physical room with participants moving around the questions and adding short responses/comments/ideas on post-it notes. The solution was to use whiteboard roaming enabling all participants to roam the whiteboards and add their responses to each question. The “Discussion Table” moderators each monitored two questions in order to organise the contributions and add extra whiteboards as needed. Once the structure of the event was finalised and agreed by the consultants I produced a timetable and briefing sheet for moderators describing the process. 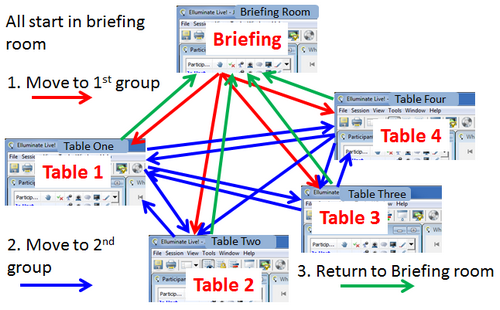 The next step was a meeting in the “Briefing Room” on the Thursday evening before the Friday morning of the event, this was an opportunity: for our State Literacy experts to brief all of us on the consultation; for the consultants carrying out the process to have an introduction to Elluminate and indicate any changes they wanted made to the way we had set everything up; and for a moderator briefing and opportunity for questions and clarification. This session was scary as one of the moderators was suffering from a very poor connection and was unable to hear most of the conversation due to audio lag and drop-out. I spoke to her by phone afterwards to catch her up on what had been discussed. I think all of us had (hopefully, well concealed) nerves that one of us would have an issue on the Friday morning. 5. Pre-preparing as much as possible in advance including setting up and converting all the slides to whiteboards beforehand so that I was able to load them quickly and easily into the relevant rooms. The whole event passed off very smoothly – to my great relief! We had a couple of minor issues that were overcome thanks to the contingency planning. One participant was unable to access her next room from her current one by clicking the link on the whiteboard, but was able to copy the link, leave the room and then join the next room. I think this may have been a bandwidth issue. When providing the link in text for this participant in the first instance I inadvertently gave her my moderator link for the room instead of the participant link, however this was quickly rectified. Another participant accidentally went to the wrong room on one occasion but moved quickly and easily to the correct one once given the link in text. One room moderator had a microphone failure and had to get a new headset. I saw this and returned to her room. The participants didn’t need me except to add a whiteboard – they already had an established conversation process by then. My connection held up well and I had no problems with maintaining all five rooms open for the duration of the event. Opened each of the four “table” rooms successively, and for each room, loaded slides, moved speaker slider to minimum and put myself to “Away” before moving on to open the next room and do the same there. When I needed to communicate to room moderators I did so through private message text in their room – this was mainly time reminders to ensure that the room changes were all occurring at about the same time. The short answer is everything! However there were some aspects where I was particularly apprehensive of issues and where the reality far exceded my hopes! Having five “live” rooms open simultaneously was far less problematic than I had feared. Organise my list of links better with more space between them and better labels to ensure I don’t choose the wrong one to pass on to someone else. We have had many positive comments both from participants and from the consultants. The amount of data gathered is very large with numerous whiteboards and much text input as well as the recorded discussions on audio from each individual “table”. Using these multiple inputs has given the data a high level of “richness” as everything is captured. This is different from the usual face to face situation where discussion round a physical table is usually captured only sparsely through outcome notes on paper. Another advantage of the online environment for this type of consultation is that there may be several discussions going on around the same table using the different media so more ideas can be exchanged in the same time period. This is the first time that Elluminate has been used in this way here in Western Australia or indeed we believe Australia wide. I have also never seen any mention of it being used in this way globally and would love to compare notes with anyone who has done anything similar to this. I found the whole process and the event itself incredibly exciting and can’t wait for the next opportunity to be involved in a complex Elluminate situation. In compensation for the last Serendipity, where I was a bit late starting the recording, this time I started it early so you have some of the initial conversation! We started with the first of these allocating 25 minutes to each. We started with the discussion question posted on the whiteboard. then we spent a few minutes brainstorming ideas that we might use to help get colleagues onboard with e-strategies for teaching. We then moved on to discuss some of the individual suggestions with those responsible talking about their ideas and thus generating further discussion. The 25 minutes ran out all too soon! Using Xtranormal was a complete change not only of topic but of exploration style! While several of us had “dabbled” in Xtranormal in the past, only one of the group had really used it. She was able to show us one of her first animations and also to tell us some of the pros and cons. We each visited and briefly explored the Xtranormal link. This of course generated more questions and discussion. Again we ran out of time far too quickly and it was time to draw the session to a close. This was a fantastic session by Sue Waters (Edublogs Support Manager) who is well known to so many of us as @suewaters on Twitter and through her terrific posts on The Edublogger. As always with Sue’s sessions this one was very interactive with lots of discussion and ideas shared through whiteboards, textchat and audio. As usual we recorded the session (please let me know if you access it). After introductions Sue began with a poll to checkout how many of us were already using RSS and/or a personalised home page. A higher proportion of participants were using a personalised homepage than were using RSS. Next Sue sought ideas from the group about our perception of RSS – this led to discussion about the name itself and its lack of clarity for most of us. There was a general feeling that Really Simple Syndication was in itself a confusing name and a consensus that it would have been more comprehensible if the name was Really Simple Subscription. I certainly found it totally confusing when I first met it but finally realised that the “Syndication” part of the name was probably derived from the news industry sharing of stories to different outlets. Sue then made the logical progression from: now we know what RSS is; to how we might use it. These points then formed the basis for a more detailed look at how RSS can be used. Sue also Application Shared her own RSS feed to illustrate her explanations and to show us how easily feeds can be added and organised. Sue made references to using a personalised homepage such as iGoogle to manage RSS and any other feeds, links and information. We had a FineFocus session on using iGoogle as a personalised homepage late last year. I so enjoyed this! I always love Sue’s sessions because there is always so much interactivity and so much to learn. 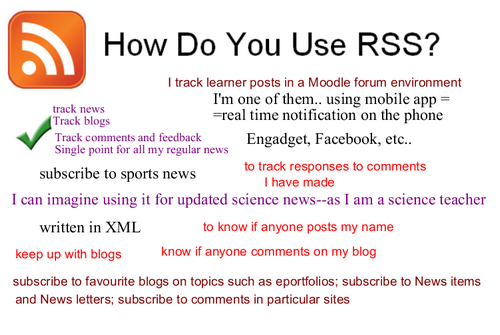 I have been using RSS for quite a long time although in a very low key way, and I gained new insights and tips. As always I took away ideas, eg using a search of my feed for information and things to explore further eg NetVibes. PS if you are interested in finding out more about a range of Web2.0 Tools checkout the Edublogs Teacher Challenge on Free Tools including my challenge on using PhotoFiltre for image editing. Our next session is an Edublogs “Serendipity” session on Thursday April 14th at 23:00 GMT/UTC (Afternoon/Evening USA) or Friday April 15th at 7am West Aus, mid morning Eastern States Aus depending on your timezone (check yours here) – in the usual Elluminate room. This is one of our fortnightly unconference sessions where we invite you to bring along your “hot topics” and “burning issues” for our poll on the topic of the day. If you want to propose a topic in advance then visit the Serendipity Wallwisher and add your topic. Edublogs Serendipity webinar overview – What can we learn from gifted learners? Exciting news – I have been holding this post awaiting confirmation that our next webinar will be @suewaters talking about RSS – see bottom of page for details! My apologies in advance to anyone who accesses the recording – I was slightly late starting it so the poll itself is not recorded. This is almost certainly because I was being distracted by the fact that immediately after the webinar I was going to be the primary Elluminate Facilitator/Moderator for a major regional consultation involving focus groups with participants moving between several rooms and whiteboard roaming. All of the other focus group sessions around the country have been done face-to-face so this was very much a first. It went well – probably more of this in a later post! 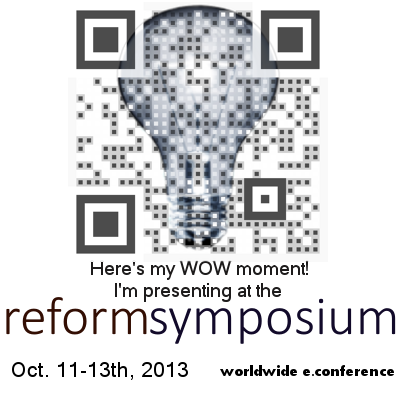 In this recorded session – please let me know if you access the recording – the topic chosen was: “What can we learn from gifted learners?” As Serendipity sessions often do this diverged a little out of the topic into surrounding issues. We started with the discussion question posted on the whiteboard. This first generated another question “What do we mean by gifted learners?” This gave rise to some interesting thoughts and ideas that addressed this very clearly, and also made some excellent points on the incorrectness of perceptions and stereotypes that exist. The whiteboard was left in place throughout and some later additions were made but most of the lively discussion that followed was through textchat and audio. We digressed at times into consideration of issues around the perceptions of some teachers when they encounter gifted students. We also talked about issues around diversity and student reluctance to be identified as different in any way from peers. This was a great session with lots of ideas shared. The discussion flowed well in textchat and audio so that time flew by and the end came all too soon!